The four quadrants that comprise Weaving Ways are interconnected and invite teachers to explore Indigenous knowledge systems. Effective education that includes Indigenous knowledge systems does not exclude or discredit other cultures, but ensures that both non-Indigenous students and Indigenous students alike are given the opportunity to see Indigenous perspectives, and the strengths and gifts of the First Peoples reflected in the schools they attend. Cultures of Belonging fosters whole school approaches that invite teaching and learning, which includes Indigenous ways of knowing, doing, and relating to promote a sense of belonging for all students. 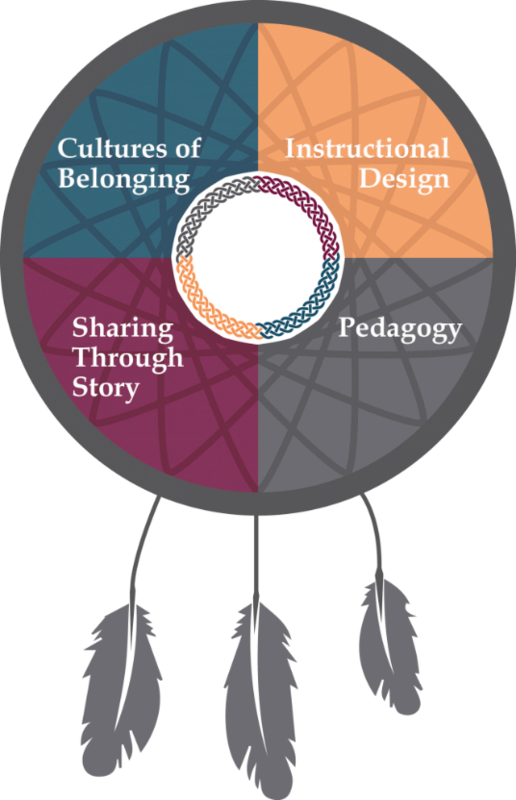 Instructional Design supports educators in creating instructional designs that value Indigenous and other knowledge systems as powerful drivers of learning to promote cultural appreciation and advance reconciliation. Pedagogy that embraces Indigenous ways of knowing is fostered by approaches to teaching and learning that include purposeful thinking about people, places and processes. Sharing through Story encourages and builds deeper connections to learning outcomes for all students through the art of storytelling in all its varied forms. Jane Atkins is a life long learner whose interests lie in helping teachers and students in their respective success journeys. She has a Special Education background and has taught Grades 2 – 8 in numerous subject areas as well as in both official languages. Through her years working in Slave Lake, she gained an appreciation of Indigenous cultures and learning styles and has continued to develop her understanding throughout her 40+ years in the education system as a teacher, presenter and curriculum coordinator. She looks forward to being able to work with districts and their teachers as we strive to gain a better understanding of our Indigenous peoples through “Education For Reconciliation”.